"Petals of Living Compassion" card set available here. "The Embodied Spirituality of NVC" DVD set available here. In me and in the other. 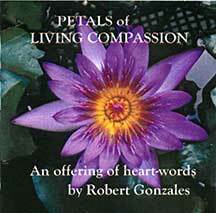 “Petals of Living Compassion” is a set of 30 3" x 3" cards with daily reflections by Robert Gonzales. A few samples can be viewed below and the cards, in a cellophane wrapper, are available for $15 plus shipping. From a 2010 web-based class offered by NVC Academy, Robert entered into a collaboration with Rashani Réa to create these elegant cards. We are pleased to offer them to you. Words on one side and this purple water lily, a photo by Jules Ruggeri, on the other. Robert's work with Living Compassion has evolved as an integration of Nonviolent/Compassionate Communication and embodied spirituality. These cards have emerged as a way to cultivate living compassion and heart-centered practice. The cards can be purchased directly from this website using PayPal. Orders will be shipped via US mail within 3 – 7 days. Below you may order 1 to 10 sets, shipped to US addresses or to adresses in other countries. For orders in greater quantity, please write to us for pricing. $15 each plus $3.50 shipping and handling. $15 each plus $5.00 shipping and handling. Outside the U.S., for orders of 1 to 5 card sets: $15 each plus $14.50 shipping and handling. Outside the U.S., for orders for 6 to 10 card sets: $15 each plus $19.50 shipping and handling.